James Anderson, a retired U.S. Marshal, comes home after a trip to the general store to find his wife Anna dying and his daughter Sarah, kidnapped by two outlaws known as Matt "Dr. Death" Jackson and "Slim" Sam Fulton, under the employ of the evil railroad baron named Bob Graham. Graham has hired several wanted outlaws to "enlighten" the people of the county to sell their land to him, so that he can make money on a huge railway. However, the psychotic Dr. Death misinterprets Graham's meaning of "enlightenment" and kidnaps James Anderson's daughter. After burying his dead wife, the retired Marshal picks up his gun once again and rides off to find his daughter. He travels around the old West, shooting his way through each member of Graham's hired outlaws.However, on his journey, Anderson is haunted by dreams of his father's murder as a child; while the two were camping out in the wild, an unknown assailant shot him in his sleep, but left young James alive, telling him "to keep that fear [of death], kid". After questioning more and more outlaws, Anderson is confronted by Dr. Death in an old mine. Anderson eventually gets the drop on him; he gets tangled up in a rope above a deep mine shaft. Dr. Death tells him that his daughter is hidden in an old Indian cliff village. After finding out that Anderson is not going to let him out of the pit, he teases Anderson about the murder of his wife. Anderson is enraged and puts his cigar in the pulley from which the rope is hanging, eventually burning up the rope and sending Dr. Death to his death at the bottom of the shaft.At the Indian village, Anderson is ambushed by renegade Indian Two Feathers. After defeating him, Two Feathers praises Anderson's strength in battle, and out of sympathy because he once had a child he had lost, tells him the real location of Sarah: Bob Graham's estate, Big Rock ranch. Anderson blasts his way into Graham's villa, and finally confronts him. After a fierce gunfight, Graham is believed dead, and falls to the ground, and Anderson reunites with his daughter. However, Bob Graham is not dead, and Anderson carelessly left his gun lying on the floor. The wounded Graham, at gunpoint, reveals that he is Anderson's father's murderer. Just as Graham is about to finish off Anderson, however, Sarah manages to shoot Graham with Anderson's gun. After a tearful reunion, father and daughter ride into the sunset. These are some tips and tricks for building custom maps with Lawmaker. They might not be interesting for experienced Lawmakers, for they deal just with general topics. I've put them up for all new Lawmakers 'cause I found no adequate newbie-tutorial. So I wrote (and still write) down things I found (and still find) out while editing levels myself or while reading the posts at the Code Alliance. Now we select the subsector and set its ground height to the height we want our door to have. It must not be higher than the room the door is in, else you get some funky results! Now, finally, we texture the outer walls of the door. If you have a look at it now in the game, it should look like a door should look. But it won't open yet! There are two kinds of doors in Outlaws, one are sectors marked with a special "door" flag. 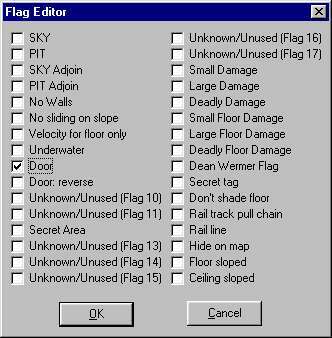 In order to make our door open, we open up the "Flags" dialog and select the flag "Door"
If the door doesn't open correctly, select also "Door: reverse". The door should open now. The other kind of doors requires some INF-scripting. Let's give a sector a name at first, let's say "DOOR", for example. Outlaws isn't case-sensitive, so "DOOR" or "DooR" or something else would make no difference. For INF-doors, it is very important to remove the door flags from the sector again. 10: SEQENDNow, what does that mean exactly? 01: I am a new sequence, I work on a sector called "DOOR"
"You need the Iron Key!" 13: ... and has not got this object in his inventory. Both the object and the screen messages have certain numbers. They can be seen in the local.msg, which hides out in outlaws.lab. When using the script editor that comes along with Lawmaker, a dialog where you can choose the stuff you need pops up when double-clicking the properties USER_MSG or OBJECT / OBJECT_EXCLUDE. Well done, that script editor! There's also a template plugin for Lawmaker, which adds some entries to the menu. When choosing such a template you just have to adjust speed and coordinates. By the way, when using locked doors, be sure to place the key to open it somewhere in your level! "It's locked from the inside!" Now that doesn't look very different, does it? There's just another spinning CLASS, at the second stop there's TERMINATE instead of HOLD, then there's another EVENT_MASK... dammit, why do I have to use EVENT_MASK 0? But when I play it now, I get that USER_MSG everytime, it makes no difference if I nudge the door from the inside! Well, there's a second part to do in the INF! 07: ... an INF message called NEXT_STOPThe inner wall works as a switch! When pushing the switch the INF sends NEXT_STOP to the first sequence. The door is opened and the first sequence is TERMINATEd. So if you push that switch again it sends its INF message but the door has got nothing to do anymore and therefore stays where it is. The number NUM that is necessary for the second sequence can be found in the caption of Lawmakers property window when you select the wall. Be sure to select the right one (it's an adjoined sector so there are two walls per side). Picture 1 shows the whole area we're talking about. The square sector is needed for the adjoin with the upper floor of the wagon. But what about that little subsector? If we have a closer look at it, we will realize that it's no subsector at all but a seperate sector (Pictures 2 & 3). When selecting the wall shown in Picture 4, we can see that it has an overlayed texture which looks like a ladder. Some weapons on my resources page are intended to replace other weapons, for example the cannon by TheOutlawDad. To make them work, you just have to give 'em the name of the weapon to be replaced, for example "igatgun.nwx". Now the cannon will appear whenever you select weapon number nine. To build your own weapon you need at least two ITM and two NWX files, if you want to create your own ammo, two NWXs and ITMs more. To those who don't know: NWX and ITM belong together, the NWX contains the graphics, the choreography (and some more things I don't know), the ITM file contains sound used, behaviour and size of an object. The following - let's call it analysis - focuses on a map called "Longbow", a custom weapon with custom ammo. You can find it in "Broken Treaty" (brtreaty.zip) at Pale's. 01: You're picking up two objects. 03: ... and you pick up five of it. 01: This tells the engine how to handle this weapon. 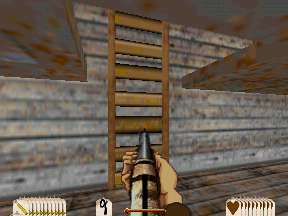 03: It uses IARROWS as its ammo. Again, Lawmaker's script-editor is very useful when editing these ITMs for it pops up windows where you can choose ammo, the handle and so on. So, if you want to use custom weapons in your maps, you have to place the ground object somewhere, not the inventory object. Some of the weapons over there also contain regenerating items, they are intended for multiplayer maps. When using custom weapons, you should neither include the weapon that is replaced by your new weapons, nor use OLPOSTAL, for it loads the original weapons - and this might cause some grave problems! The level (lvt) and object (obt) files Lawmaker creates, are in ASCII format. You can have a look at them in simple text editors (such as notepad). The levels from Outlaws v2.0 (olpatch2.lab) were distributed in a special binary format. OZ_Raptor wrote a little tool to convert 'em back to ASCII. Now, some mappers publish their maps also in that binary format, I always wondered how they converted them. The argument "/tokenize" causes Outlaws to create map.obb and map.lvb, the binary versions of your text file. The binary files are much smaller and thus load faster. For a Historical Mission, you have to create only an RCA file with the title in its header as shown above; Outlaws will show the title. For a Single Player Mission (appearing at "Main Game"), you need at first an RCS file. The mission is now already selectable and playable from Outlaws' main menu; but the title that is shown now is just the name of the LAB file. To make appear the title that you want, you have to create an additional RCA file with the name in it (just copy the RCS to an RCA file). Unfortunately, the level now appears in both menus. So, it doesn't seem to be possible to show the correct title of a level in "Main Game" without showing the level at "Historical Missions" as well, for Outlaws takes the level name from the RCA. I assume that you have stored every level in a separate directory. First of all, copy all the contents of that directories into one new directory (let's call it the release folder). Create a LAB archive with ConMan (or laber, as you like it) and add all the files from the release folder to the LAB. Now you already have the first part of your release! Now you need a story script. It tells Outlaws, how your campaign is called and which story texts and levels are part of your campaign. Note that "NAME: " determines the name how it appears in the game; "LEVEL: " is the name of the level file in your LAB archive. The story script needs exactly the same name as the LAB, so if your LAB is called "test.lab", the story script needs to be called "test.rcs" or "test.rca" (depending on if you want to make a single player or a historical mission). Mappers usually add a text file to their distribution with some miscellaneous information, such as specifics of the level(s) (textures, objects and stuff), author infos, and credits. You can get a template for such a readme right here. By now, you can put the LAB archive, the story text files, the story script and the readme into a ZIP archive and send it in. There's another possibilty to distribute a map; it's the best choice if you have a custom LOCAL.MSG (that's the file with all the screen messages) or a custom scrolling background for the story texts (like I did in "Aunt Rosie"). Therefore you put all your files (level files, textures, story text files and the story script) into your LAB archive. Rename the LAB to something like OLPATCH#.LAB, for example OLPATCH8.LAB. Outlaws will then think that your file is an official patch by LucasArts and load all its contents automatically. The "pause" statement is needed, for Mr Windows launches "olwin.exe" somewhere in the background and continues with the batch file; it restores the original name long before Outlaws can see it. I wrote this originally for "Aunt Rosie", but would you execute a downloaded EXE file written by someone you don't know ??? 1876 maps (im dead serious). as far as i know all of em multiplayer. Such a great game!Can play it 1080P 60fps these days!